As with all training classes, IAT is taught by an accredited Alphacam instructor. The instructor will walk each student through the tutorial, answering questions and providing software tips throughout the class. To allow each student to take full advantage of the course, each class will accommodate up to 4 students. This enables the instructor to pay special attention to each student and create a comfortable learning atmosphere for both the student and the instructor. The objective of this class is to familiarize students with basic features of Alphacam software. This class is excellent for those learning Alphacam for the first time as well as experienced users who would like a refresher course. Understanding IAT is essential for all students who plan to participate in other Alphacam courses so they can take full advantage of the software's functionality. Advanced Alphacam Drawing and Machining is a supplement to Introductory training for students requiring a more in-depth familiarity with Alphacam. This follow-up course is intended for Alphacam users whose work demands require further skills development in the CAD/CAM environment. There are 3 areas of focus presented in 3D Advanced Functionality for Alphacam. Each builds on the material from the one prior. The purpose of this course is to come to an understanding of the creation, manipulation and toolpath programming of 3D surfaces in Alphacam. Offered as an additional examination of 5 axis machining for trainees whose primary production requirements are machining solid parts with 5 axis machines, this supplemental course may be taken as a separate class or combined with the previous 3D Advanced Functionality. The purpose of this supplement is to add an understanding of the practical requirements applied in Alphacam when dealing with 5 Axis toolpaths. In order to make best us of this supplement the user must have a working knowledge of the three advanced areas of Alphacam, Feature Extraction, Solid Manipulation & Machining practices and Work planes. These three modules of Alphacam will be used to assist in the creation of suitable solutions to 5 Axis tool path needs. Parametric Constraints are available in Alphacam modules at the Advanced or higher levels. A key component in automation for Alphacam, Constraints are a powerful tool for daily production of similar "families" of parts. Understanding Parametric Constraints is a necessity for using Alphacam's APM module. It is a highly recommended course for door, window and stair manufacturers as well as shops making repetitive series of parts in a wide range of sizes. This course will explore the solid model feature extraction and utilities available in Advanced modules or higher of Alphacam. If you have come across any of the following types of files: .dxf or .dwg with solid bodies, IGES as a solid, STEP, Parasolid, STL, Solid Edge, SolidWorks, Inventor, ACIS, Catia and ProE, and don't know how to address them in Alphacam, then this is the class for you. The trainee will be guided through the solid model file types that can be input into Alphacam, expanding knowledge of utilities that are available specifically for use with STL file types. 1. 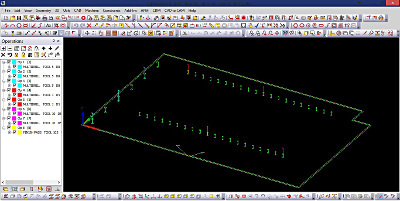 Features extracted to Flat Land for normal 3axis, 2D machining. 2. Features extracted onto Work Planes for normal 3, 4, 5 axis positional machining. 3. Edges projected to work planes to create boundaries for 3D Solid Machining. As an Adjunct to 3D Advanced Functionality, this class can be added to 3DA as required and as time permits. As a Standalone update course, this class can be part of a customized training session or delivered hourly online. Part Modeler is offered as a companion module to Alphacam for those needing solid modeling capacity in the creation of their machinable surfaces and geometries. 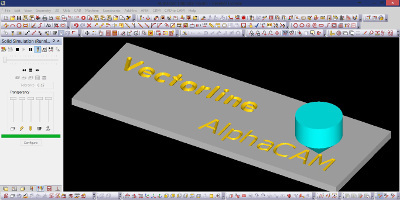 This expands greatly on the basic surfaces creation methods available to core Alphacam. Solid modelling is the most commonly used method of creating computer-aided designs by design engineers. In basic terms, the designer creates an actual true sized, three-dimensional model of the component, which can be parametrically constrained to enable quick and reliable modifications to be made to the design. These three dimensional models commonly referred to as the Parts, can be used to drive drawing sheets and tool paths, allowing any design changes made to update these sheets and tool paths automatically. This eliminates the need to go back and do these changes manually and is what’s known as the Master Model principle, where any related documents are associative to the master model. The Advanced Part Modeler course expands on items covered in the standard course. Differing methods of creating profiles, construction planes as well as looking at further options available within the modelling side of the software will help the student to create much more than basic cube-style models. This in-depth examination of the advanced model-creation functionality within Part Modeler will allow the student to gain the knowledge required for creating complex, flowing 3D solids for machining applications within Alphacam - without having to rely on 3rd party software. Standard Part Modeler is a required prerequisite for this course. A basic knowledge of Alphacam geometry creation and toolpath programming is a prerequisite for this course. This class is required for study on the following C/Y Axis Lathe Machining course. Today the trend is moving away from standard two-axis CNC lathes towards machines with driven tooling (Milling Tools) and multi-axis functionality including Sub spindle machining, this is becoming harder to program manually, with this in mind Alphacam have introduced a full 5 axis Turning Module, this compliments the existing Turning Modules which will simplify the programming of such complex parts. The following tutorial moves on from the Standard 2 axis turning to C and Y Axis programming, the following part illustrates this by a step by step approach to 4 axis machining. The Alphacam Stone module has special considerations for certain machining functions due to the unique requirements of cutting stone materials. Because of this, the student will re-visit Machining and Tooling definitions, Pocketing and Auto Z Machining within the context of tool loads and material removal strategies present during stone machining. Advanced profiling has an emphasis on specific areas of concern unique to laser, flame and water jet cutting operations. Areas that Alphacam users have familiarity with as a result of Introductory Training will be reviewed and expanded upon for their relevance to this module. Nesting, machining styles and start points, for example have functional uniqueness in this module. These are addressed in practical examples and exercises in this class and include the following topics:. CDM (previously AlphaDoor) is an add-on module to Alphacam Router intended for high-volume producers of cabinet doors. 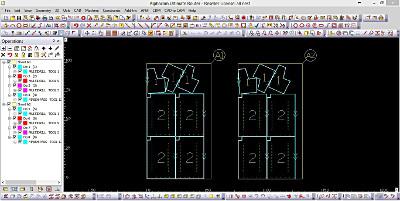 CDM is a wizard-driven database application, designed to manage the design, creation and production-to-order of cabinet doors and drawer fronts. Training on this module consists of practical exercises and setup to actual working requirements for the trainee's plant and equipment. Familiarity with core Alphacam geometry creation and machining is required as a prerequisite. 1 System Set-up. Setting the working environment units, locations etc. 2 Materials Set-up Material definitions sizes and nesting restrictions. 3 Door type Set-up Definition of the machining applications on a door style. 4 Order Creation Set up an order with customer details, door types and sizes. 5 Production Queue Combine Parts from orders to produce a production run. 6 Code output Output the code suitable for the machine. 7 Report generator Create order reports together with Labels and barcodes. Learning to draw with the APS Geometry commands in Alphacam allows users of CDM to automate that process by means of the Macro recorder. This in turn, allows the CDM user to create new door styles beyond those included in the CDM package. Although the VBA editor included with Advanced and higher levels of Alphacam provides a more powerful tool for the creation of new door styles, the Macro recorder has a simpler, more straightforward interface which is generally more accessible for the average Alphacam user. This course will familiarize the trainee with the APS system, creating bounded geometries, by means of plotting lines and arcs through turns at co-ordinate points. The macro recorder function found in the geometry menu of Alphacam will be used to create a sample CDM door macro. The CDM door macro may then be included into CDM for parametrically correct, auto regeneration of door sizes. APM is an add-on module to Alphacam Router used typically by manufacturers of windows and doors, but it is also ideal for assemblies of coordinated, parametric parts for furniture, marine and pre-fab architectural components. APM processes either single or multiple parametric, (constrained), drawings and is supplied with a sample set of window and door examples. It is essentially an empty tool that allows the definition and manufacture of multiple parametric parts in a user-specified manner. APM provides functionality for either creating orders for components in the program interface or importing the order data from external sources, such as spread sheets or other database programs. The trainee will produce sample trial output using files from in-class exercises. Output is achieved through CAD to CAM functionality of Alphacam, although prior experience with CAD to CAM is not required. Successful completion of this course is contingent on understanding key components within Alphacam's core functionality. A minimum of 3 months experience using an Advanced level or higher of Alphacam is required. Trainees should be comfortable with standard geometry creation, toolpath programming and basic editing commands for both geometries and machining. NOTE: familiarity with constraints and machining styles are prerequisite.